Alliagtors, crocodiles, turtles, tortoises, iguanas, geckos and snakes are all common reptiles. Reptiles range from LARGE to small, from coloured to plain. There are so many different types!! This is an American Alligator. Alligators live in the water and on dry land. Their huge flat tails are used like paddles to help them swim. 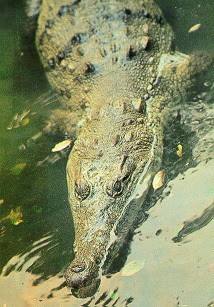 The alligators nostrils are at the very top of the long snout so that the creature can breathe when floating ontop of the water. This is how alligators can catch their prey. Because of the rough, knobbly skin on their backs, they can camoflauge into lumps of floating bark or log when half submurged under water. Alligators can spend up to 5 hrs underwater without breathing. The alligator has sharp and cone shaped teeth designed for holding prey, not for chewing it. Alligators swallow most food whole. The freshwater crocodile lives in freshwater lakes and rivers. It has black bands across its back and is usually light brown to green. They are not harmful to humans and prefer to keep well away. If corned or forced, they can lash out, and inflict serious injury. 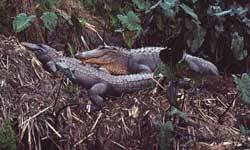 Crocodiles mainly live on ffish, but their diet also includes insects, turtles, and other small reptiles. Ths is a broad-headed snake. 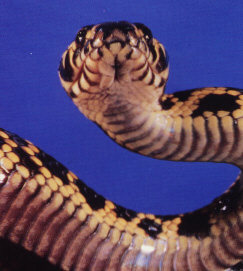 A broad-headed snake has a black body with dots or bands in yellow over the top. As the name suggests, these snakes have a wide head that, when threatened, the jaws can click open, and the snake can widen its head further. These snakes eat small lizards like gecko's but during summer times neat mainly mice. The thick-tailed-gecko has its description in its name!!! It has a large, thick tail. They also have scattered yellow spots over their backs. Thick-tailed-geckos live in scrubland, desert, and wet or dry forsets of Southern Australia. They eat mainly small insects like spiders. They reproduce during early spring and only lay 2 eggs at a time. The Murray River Turtle aka The Macquarie Turtle. It lives in rivers and lakes of Australia, it eats crustations and other small water creatures. The adults often eat grass or water plants. The Murray River Turtle hatches eggs in spring or summer in underground burrows. It returns briefly to check on the eggs. The eggs hatch about 8 days after that. 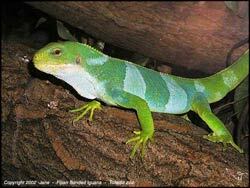 The banded iguana, (as named after its strong bands across its body). Only the male has the large green and pale-blue bands. They have large, sharp claws to assist them when climbing in the trees. They live in forest trees of Small islands like Fiji and rarely walk on the ground. They generally are herbivores and eat leaves they find in their tree homes but will eat insects every now and again. 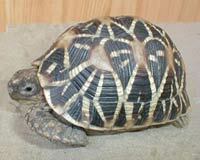 The Star Tortoise is named after the star- like pattern across its shell. Male are genarally smaller than females. They inhabit the scrublands of India and Pakistan but are also found on the Island of Sri Lanka. They are herbivores and so they eat leaves, shoots, berries and fruit. Females lay 4-8 white eggs in a dug hole in the ground which then hatch 3-4 months later.